You might have encountered many of friends who come to you for suggesting them a phone and tell you that their budget is strictly under some 7k or 10k. They would ask you to tell a phone with loads of gaming like some Galaxy S3 or Nokia N8 would have but don’t even want to raise the budget up to some 13-14k because as they say, they are not that tech savvy. So what you suggest to them? This is exactly where Nokia is hitting nowadays and for the same reasons, Asha phones actually been a huge success in market even if you don’t read a lot of sweeping reviews about them. 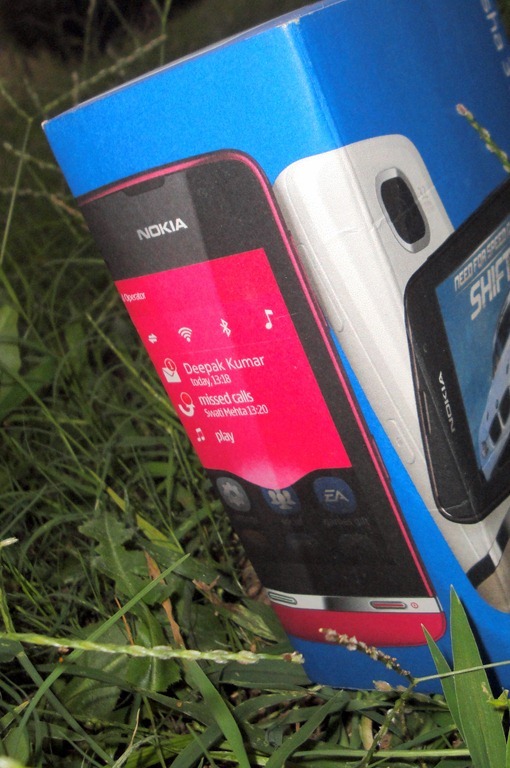 As I mentioned in last Nokia Asha reviews as well, its been interesting to notice that Nokia knows that what are the strength about these phones and been stressing on it even on the packages itself. The package itself shows off the gaming potentials, promises loads of EA Games (40 of them comes free with it, not preloaded though). 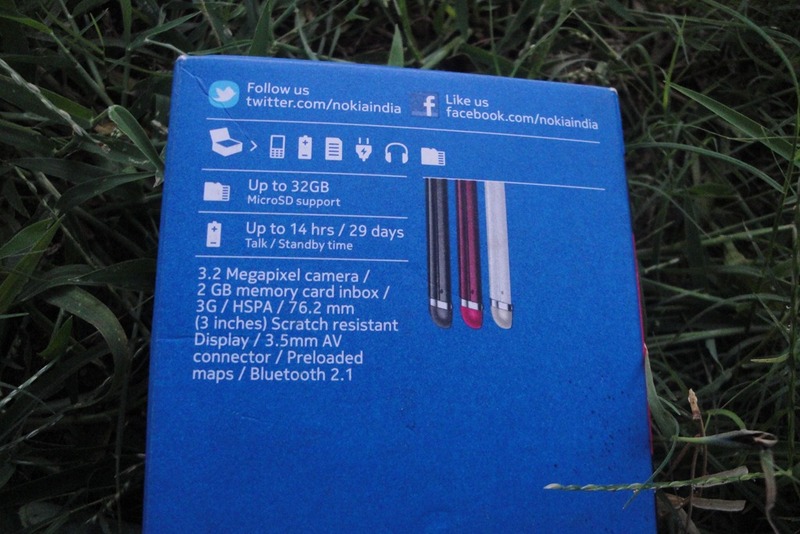 Also the package doesn’t misses to make a mention of two strong assets that WiFi capability and Nokia Music. Also it doesn’t misses to make a mention of its new UI and support for regional fonts as well. The box also shows off the other capabilities in short and tells us about its nature friendliness too. So, its been a lot about the box now, let’s open it. While the quality headset and top notch charger will get an applaud from me, the absence of a just 200-300 Rs USB cable pinches. But on the other hand, I can understand that what is the target audience for the phone. 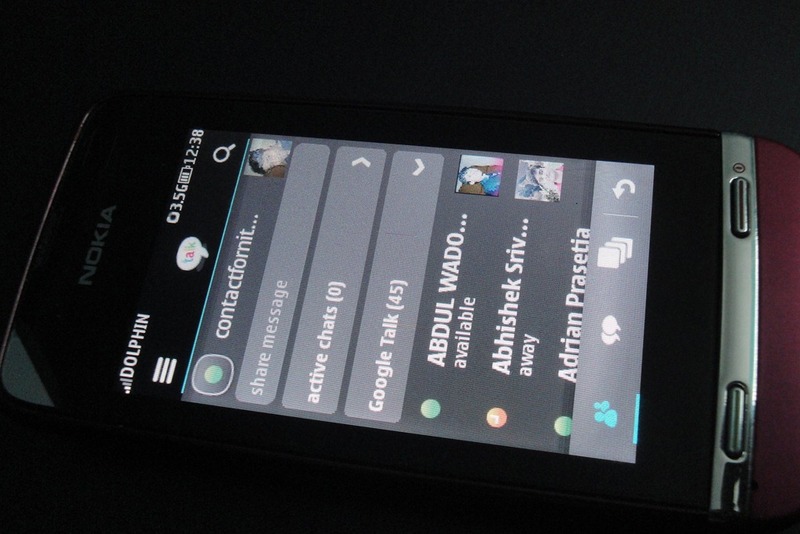 As I said this is the most cute handset of the Asha Series (till 308/309). 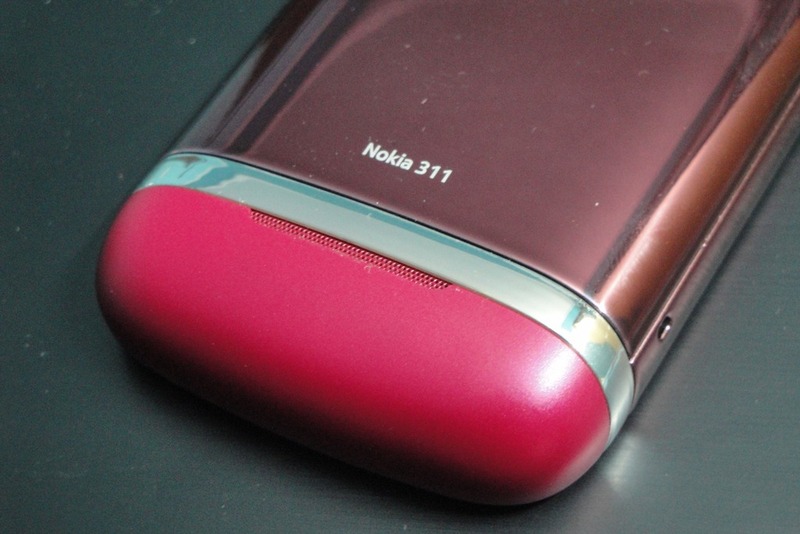 Small, slim and smooth in hands like Nokia C5 etc would have been. 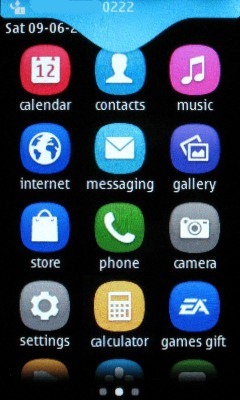 The 3” screen of Nokia Asha 311 have a resolution of 240×400 (WQVGA) which though posses a lower ppi (155) than regular smartphones, but the colors and screen actually look a lot better than those earlier Asha models. Still the pixelation is not that hard to notice. The presence of Corning® Gorilla® Glass means you can expect this device to be a lot sturdy than any other low price device. You can see that how better it might be even in close looks when it comes to display. 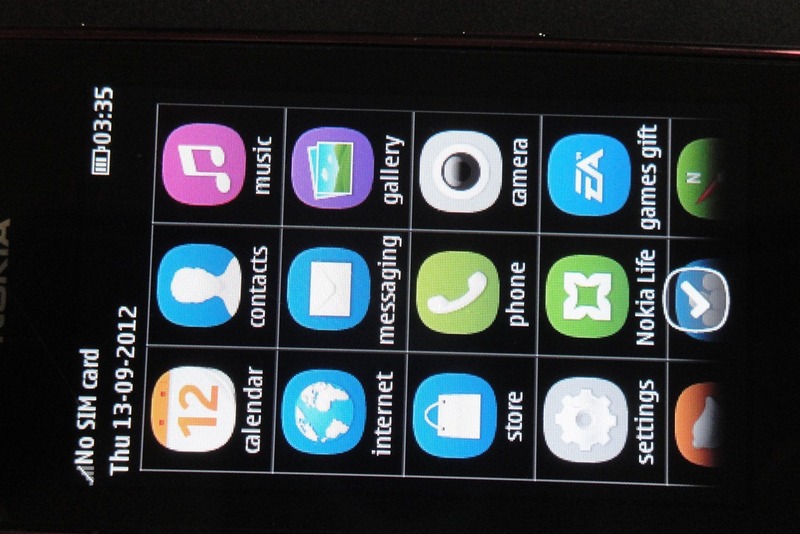 Same icons like Symbian^3 has nowadays and minimalistic UI without menus. Even though colors are 16bit only but somehow they manage to look more richer on this phone. Way to go S40. No sharp corners at any side and then just 3” of screen go very handy with each other. Two raised buttons in the bottom. It would have been more smoother if they would have gone for capacitive buttons, but in a way, I am glad that they chosen the physical buttons instead. 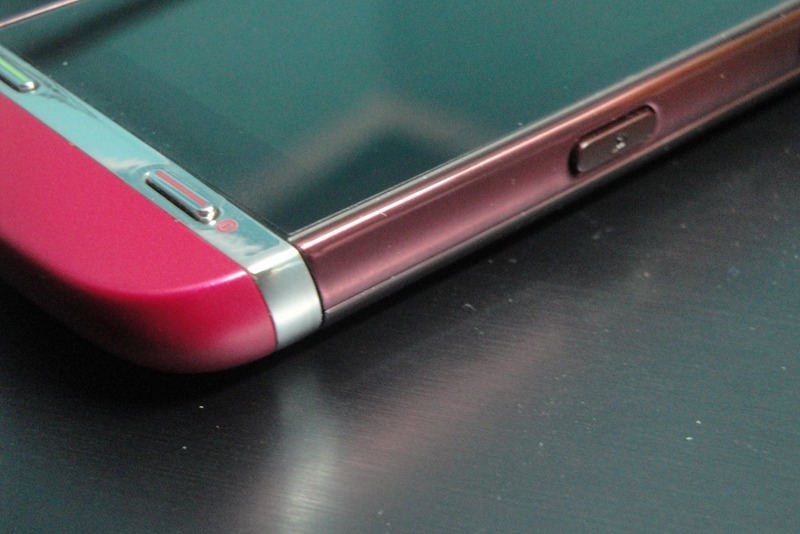 Tiny physical buttons on metal strip go so well with the overall look of the phone. The microphone lies under the green call key at the left side. Proximity and Ambient sensor in a 6k INR phone is something that one couldn’t have believed till some time before. Presence of them denotes that this tiny phone can handle change in surrounding just like those smartphones. 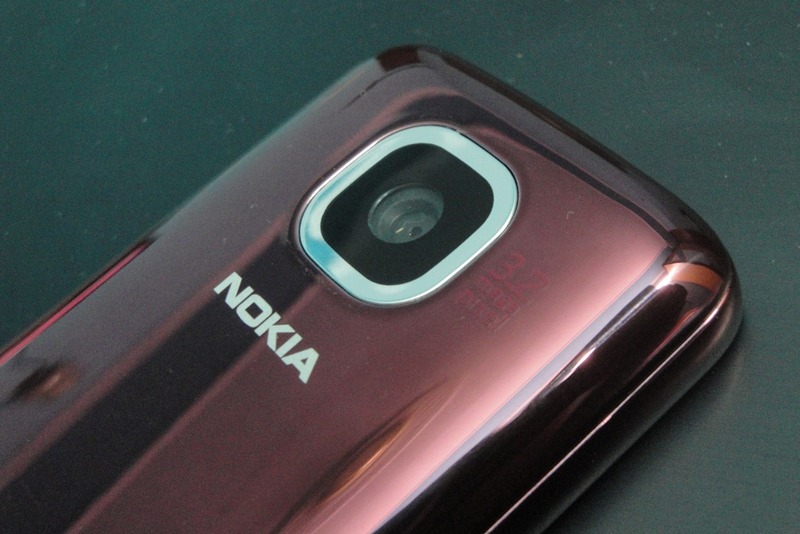 The glossy back contains a moderate 3.15 MP Fixed focus and VGA recording camera without any flash. Even if some might not like the glossyness of the back, there should be no denial of the fact that the build look so fab for such a low end phone. 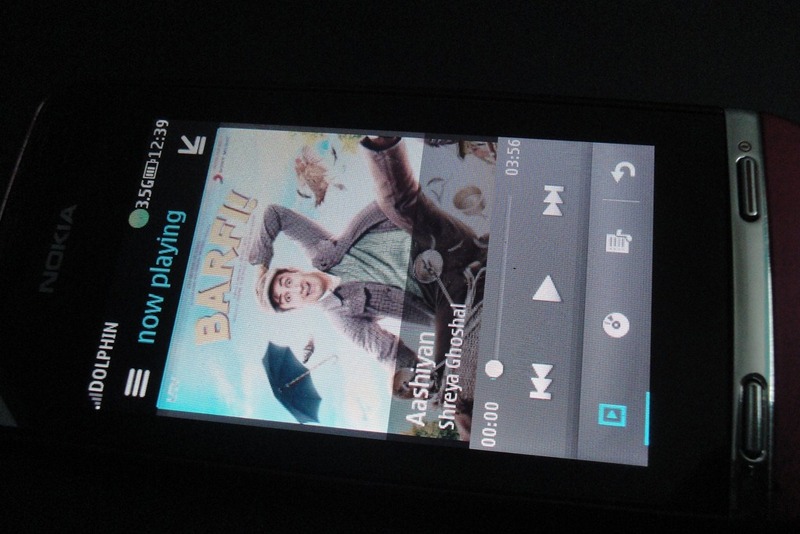 The speakers at the bottom are well louder like rest of Asha series phones, actually much better than any of them. 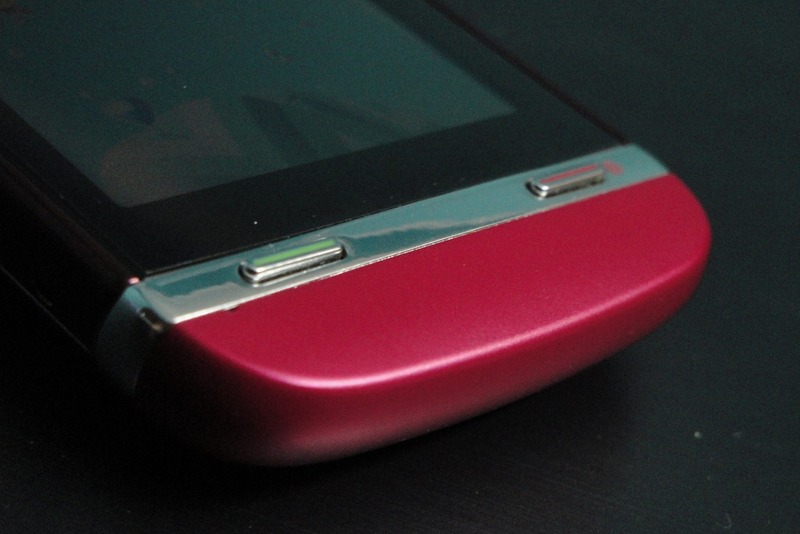 The side of the device contains the lock keys and volume buttons in the same color as rest of the body with right amount of tactile feedback. The bottom has a camera key as well not two step press, but one step only as the camera is just fixed focus. 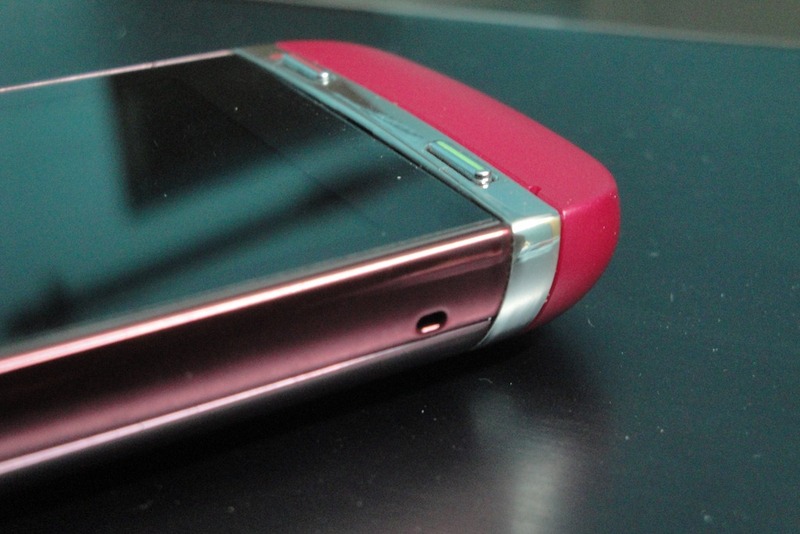 The other side of the phone seems to have the lanyard eyelet on the side while rest of the side is plain. 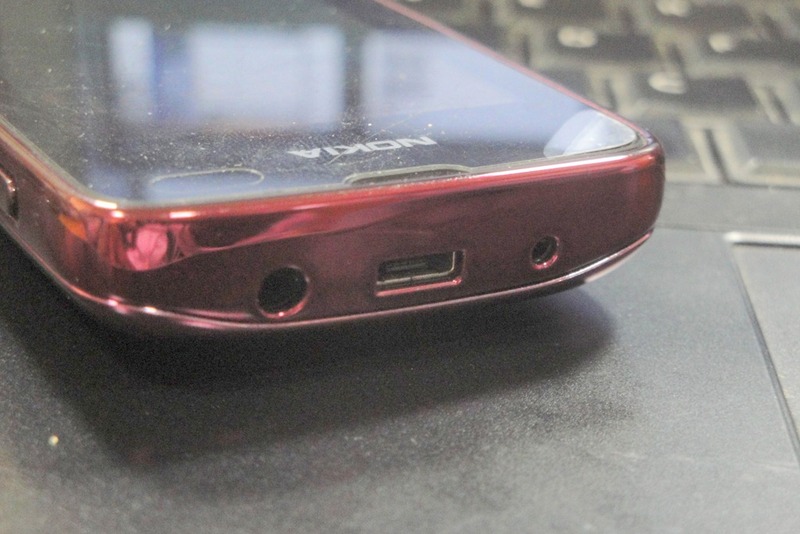 The top of the device contains 2mm power point, 3.5mm Audio jack and one open MicroUSB slot without any covers. Durable I would say. I actually tried to figure out that what’s this shiny piece is at the back panel, but couldn’t figure out. 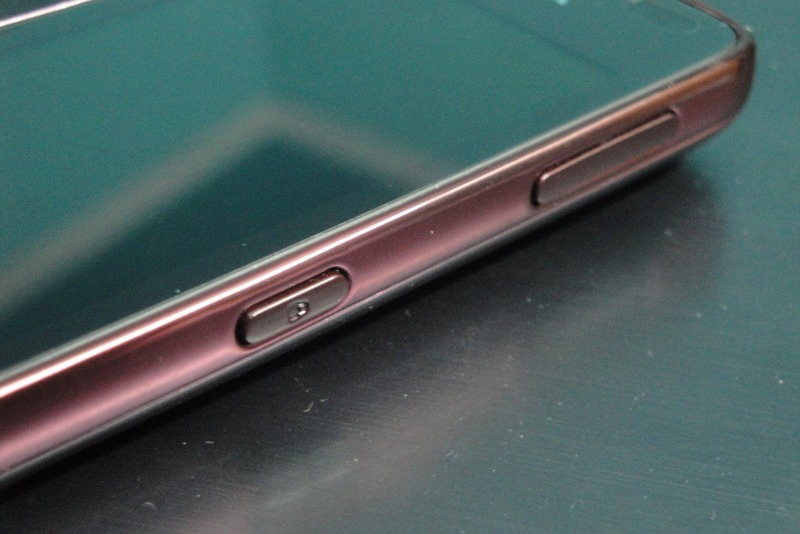 It is not metallic like some of the Asha devices but all I can say that the back panel is a lot more stronger than the recent flagship phone from Samsung (actually I think this phone will mind it if we even compare it with that kind of back cover). This is a section which usually stands as boring part when it comes to feature phones, because one doesn’t expect much from sub 10k phones when it comes to flaunting specs sheet. 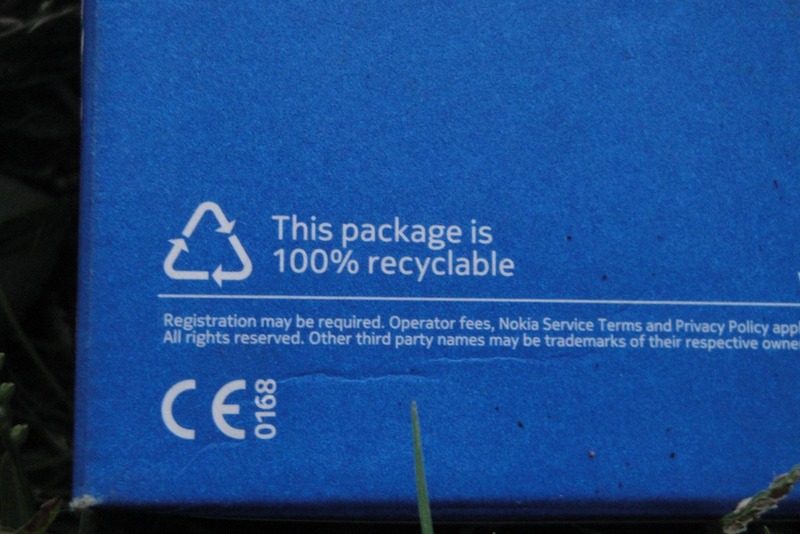 But Nokia Asha 311 beg to differ on it. 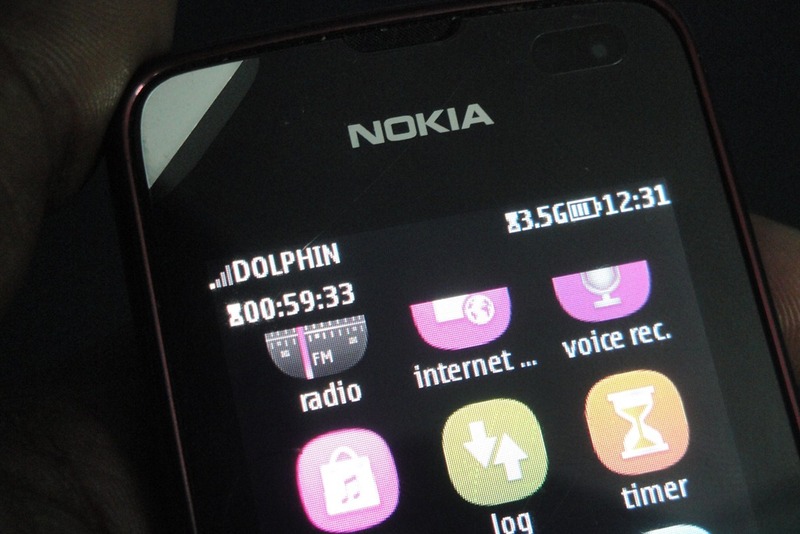 So, you can see that if Nokia Asha misses something from some smartphones, then it would be lack of GPU, 24bit colors and GPS otherwise it beats many of higher priced models too. 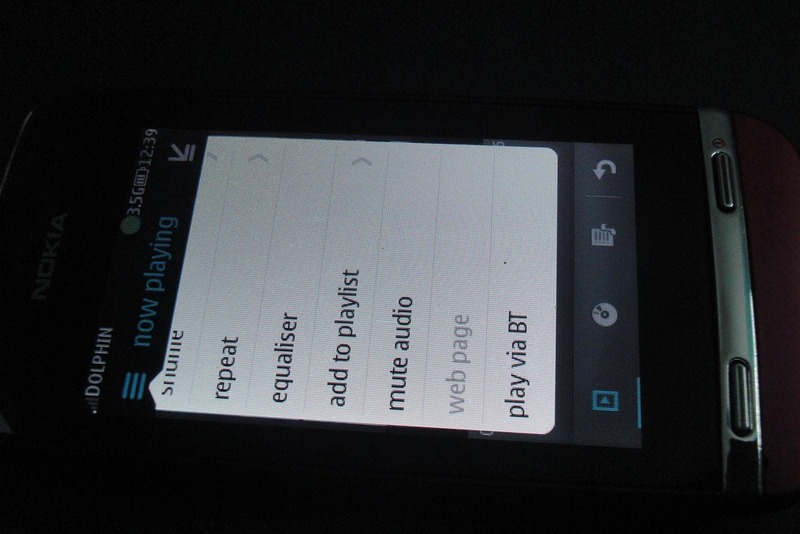 For some strange reasons, I am unable to see USB OTG in feature list though I don’t think many would notice the same. 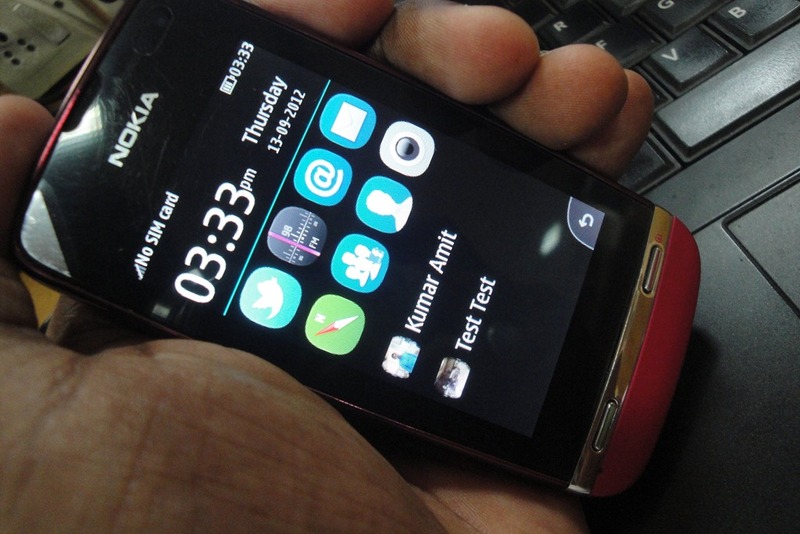 I seen many debates on twitter claiming whether Nokia Asha phones stand as “Smart” or not and while I might have agree on some opposite points, I would like to state that running multiple tasks at the same time should be termed as Multi-Tasking but capability to do multiple things seamlessly should be called as “Smart”. There is a big difference between the two things, which should not be confused with each other. My point would be more clear when I would explain the UI further. 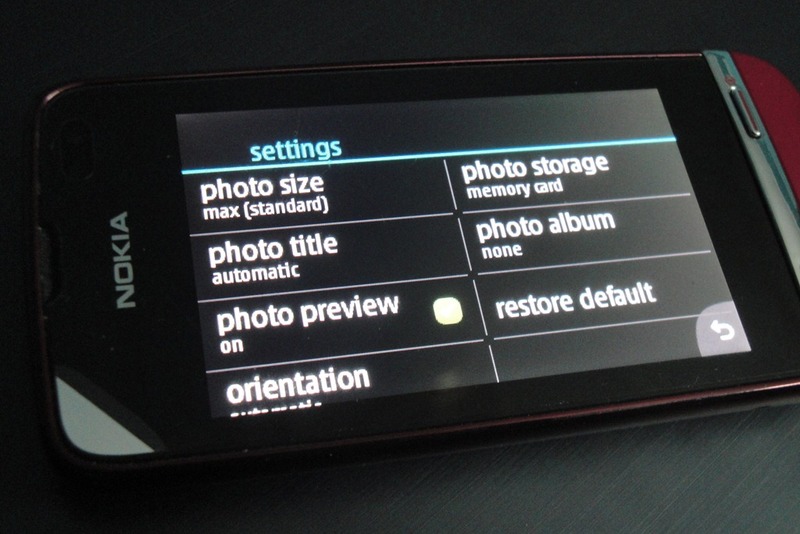 The new innovative Full Touch UI inspired by N9’s MeeGo is basically divided into five parts. 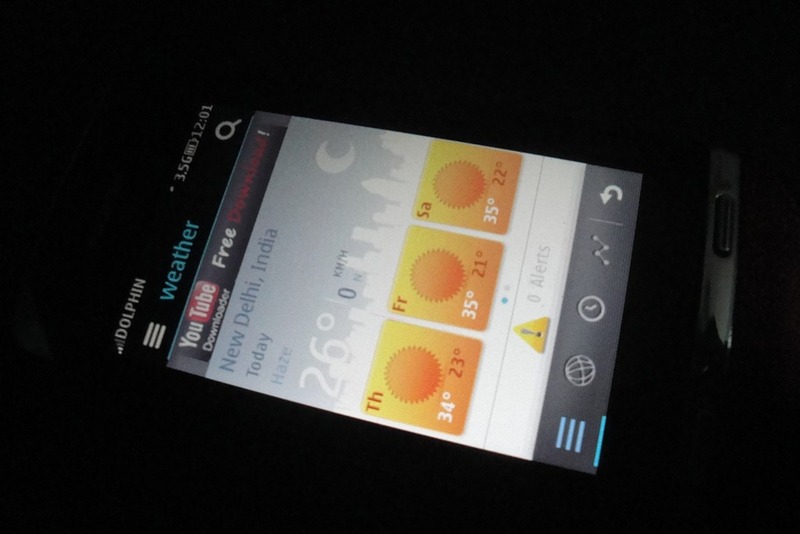 Shortcut screen on left, which contains Alarm/Calendar shortcuts by default & more shortcuts and contacts can be added. App launcher screen in center, which contains all the apps (icons show notifications as well). 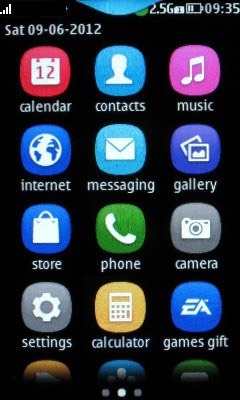 The home screen is a resemblance of what we seen with Meego just like the icons and even functional in the similar way. 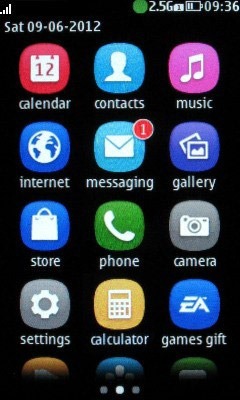 After the home screen, you meet with the App Launcher screen, which looks like MeeGo app launcher and in some ways behave like iOS by displaying alerts over the app icons themselves. Not only that but there are some nice touches as well like in first set of screenshots, you would have noticed the green chat icon (Gtalk, Facebook, Yahoo etc) and the above shows off that how the drop down keep on hanging with the number after a missed call. 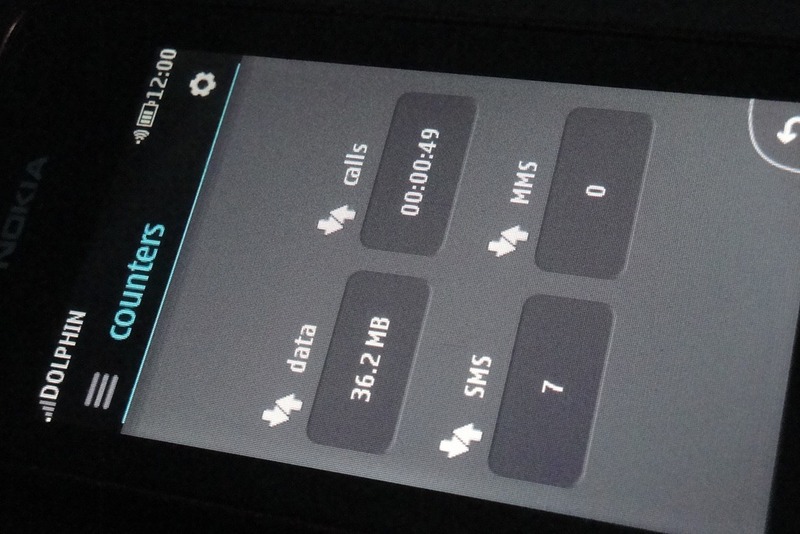 The four toggles on the drop down bar denote Mobile Data, Bluetooth, WiFi and Volume. 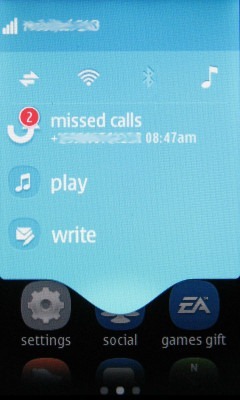 Then three common actions like Call Logs, Music and Messaging are always accessible anywhere in UI just a drag away via the same drop down menu. You still feel this new Series 40 OS is not smart, just because of no conventional multi-tasking? Think again. Also though there is no folder support, you can rearrange app as your choice. No drag and drop though but hold an app first and then when shows select, then just tap over the location, where you want to put it. Rest will be rearranged automatically. The next interesting section is the shortcut screen that looks like standby screen in first sight and provides you a click link to Alarm & calendar apps. But when you tap and hold your fingers on it, then provides you options to add lots of shortcuts and contacts on the same screen for quick access. 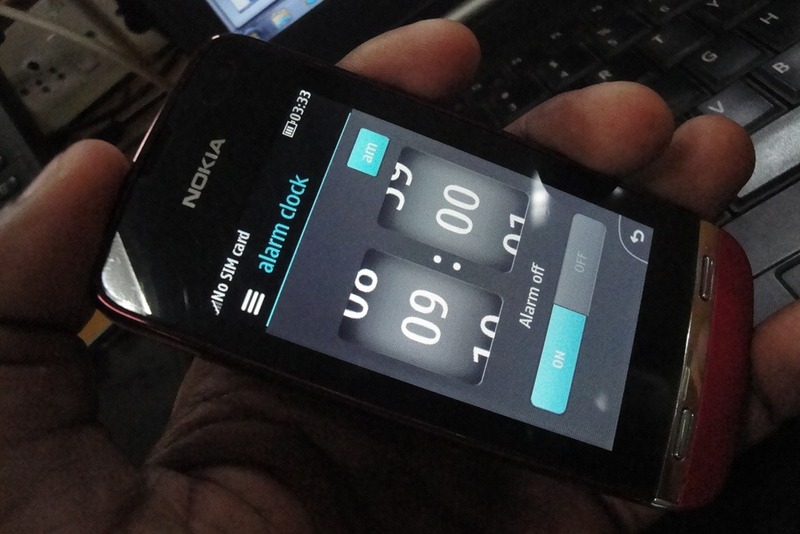 Quite interesting and rivals even Symbian\ Android Home screen experience apart of widgets. 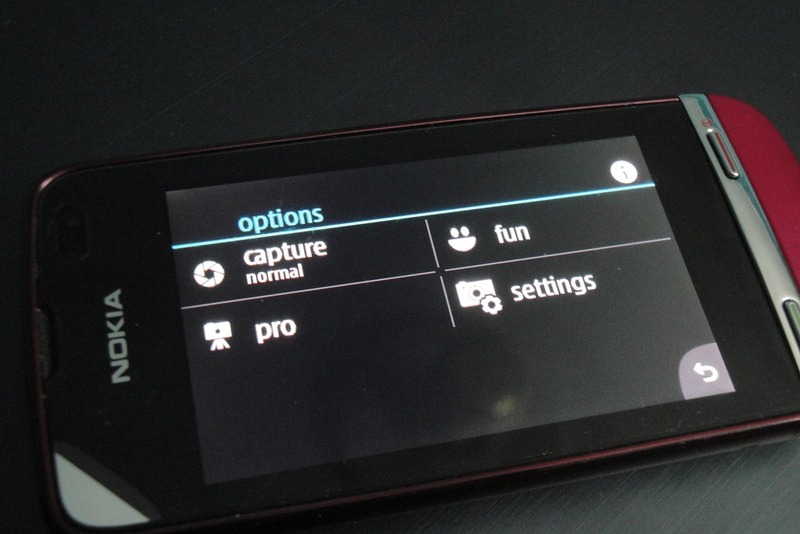 The last screen on right that I called Action screen, can be configured to be any of three options. 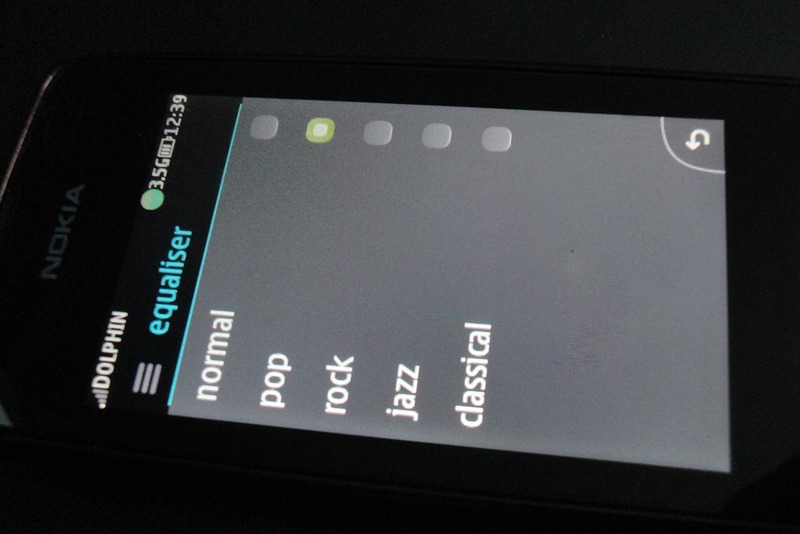 Either it can be the Dialer or be the Music Play or FM Radio. Some might prefer it to be Dialer only, though I would prefer it to be FM Radio because Dialer can be accessed by the physical key any time and Music player is just a pull down away. You can access your notifications any time while doing any other task, you can move over any of your favorite action quickly, you can install variety of apps, you have an experience that is very seamless across various options and you have a literally full touch OS for just around 6,000 Rs. If this doesn’t stand for smart, then I doubt the very definition of smartphones. 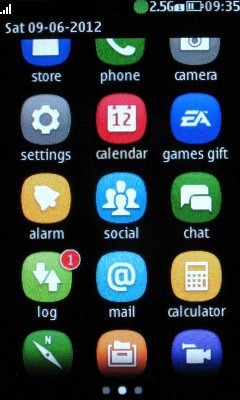 There are a lot of apps for earlier not that app friendly S40 OS. Let’s introduce me some of the bundled apps. 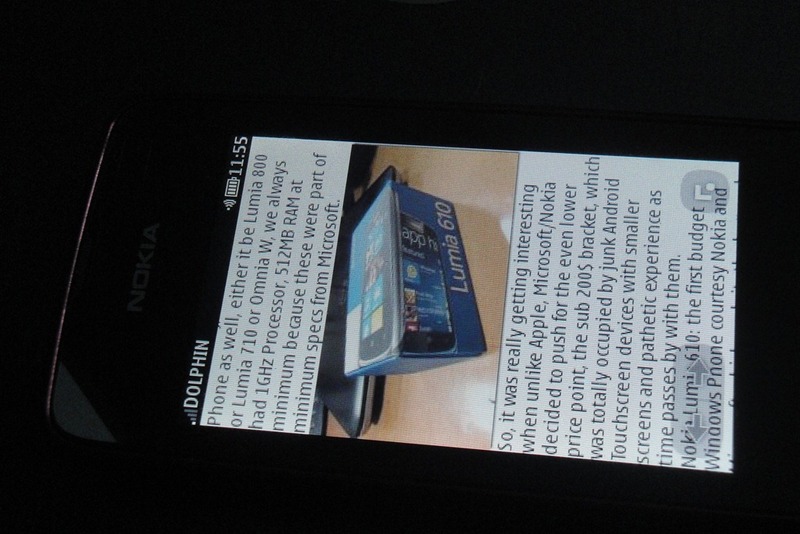 Nokia Browser: Nokia Asha 311 has quite convincing browser for most of the needs. It doesn’t support Flash but for the rest of things, it just works perfectly fine. UI is quite interesting and feature rich. The browser even have a download manager, single column view and rest of the usual things like favorites and bookmarks. Lots of settings and even a dedicated data counter, just for the browser. 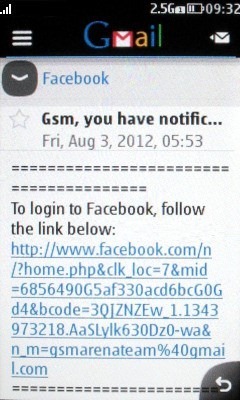 I am sure even Symbian^3 browser doesn’t have such richness in start if we talk of UI. We even have option of sharing the pages to Social Networks as well. Camera: Obviously one shouldn’t expect much from a fixed focus camera (30cm to infinity) without flash 3.15 MP camera, but the UI is interesting and settings are simplistic. Tapping into settings gives some more options as well. I obviously won’t talk much about photo quality of Nokia Asha 311 as one doesn’t expect much from a 3.15MP fixed Focus Camera neither does it have trickery like ground breaking iPhone 5’s Panorama but it does a decent VGA video at a frame rate of 25 fps than the regular 15 fps video that phones of similar price range used to do. 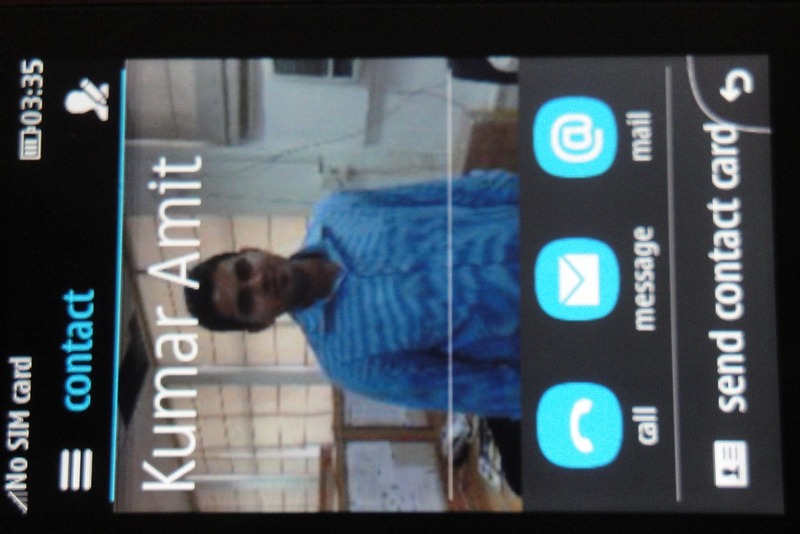 Contacts: Contacts app actually looks better than its MeeGo or Symbian siblings due to full screen images..
Only issue is, I couldn’t find a way to Sync in with the Cloud even though there seems to be a setting for Synchronization. May be like the calendar, this also doesn’t support some server side synchronization. 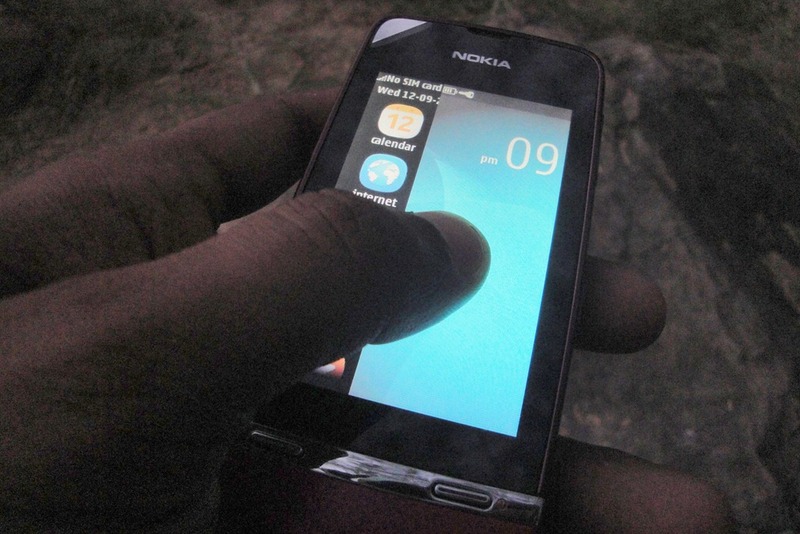 Emails: Honestly speaking, due to some bug in my SIM or WiFi, I couldn’t manage to configure the Emails myself but considering the fact that they ran well for others and ran for me on other Asha handsets, I would treat it as a separate issue with my unit only. 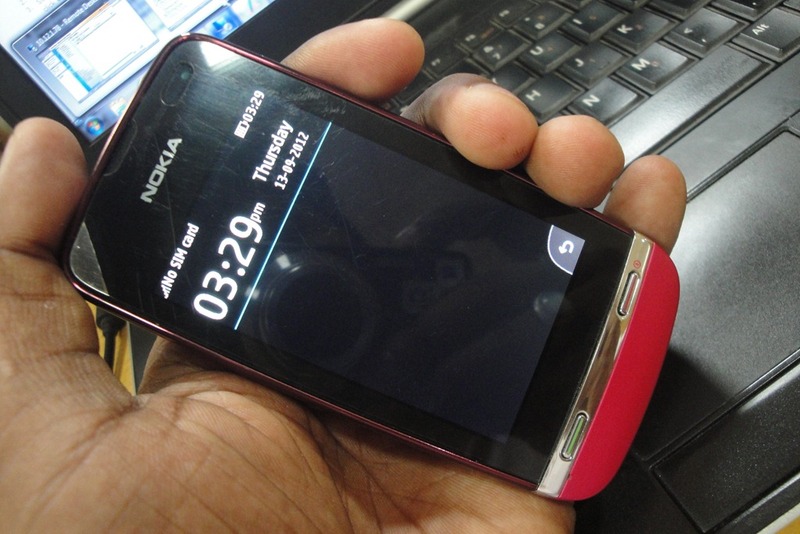 Though we still don’t have Exchange Emails for S40, but Nokia has promised an update soon. 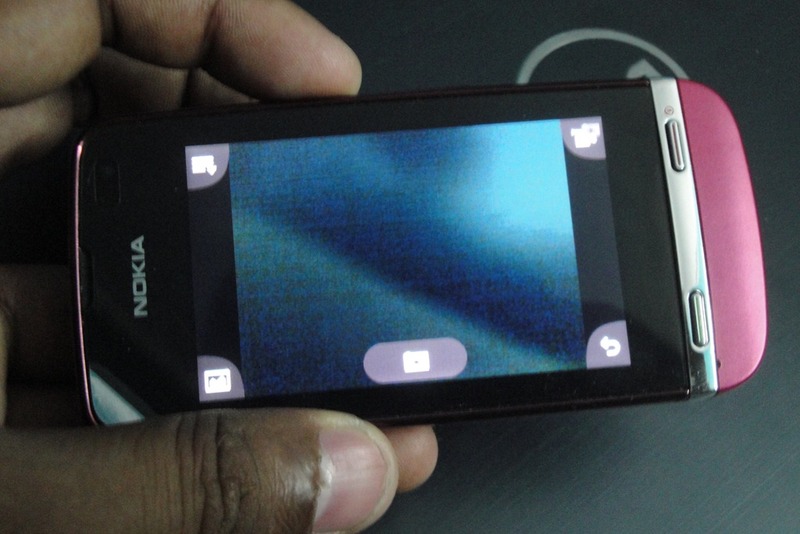 Video codec support: One thing that will surprise people about this low end phone is the extensive codec support. 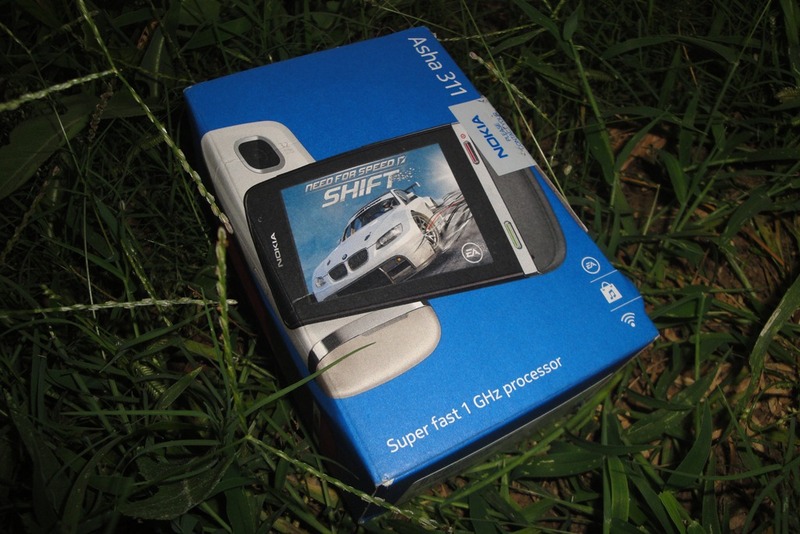 This tiny phone can handle almost all popular video codecs including XVid, Divx and even mkv if lower than 720p. This is something even high end smartphones might struggle on. Counter App: It got a counter apps as well that covers a lot of things at same place. 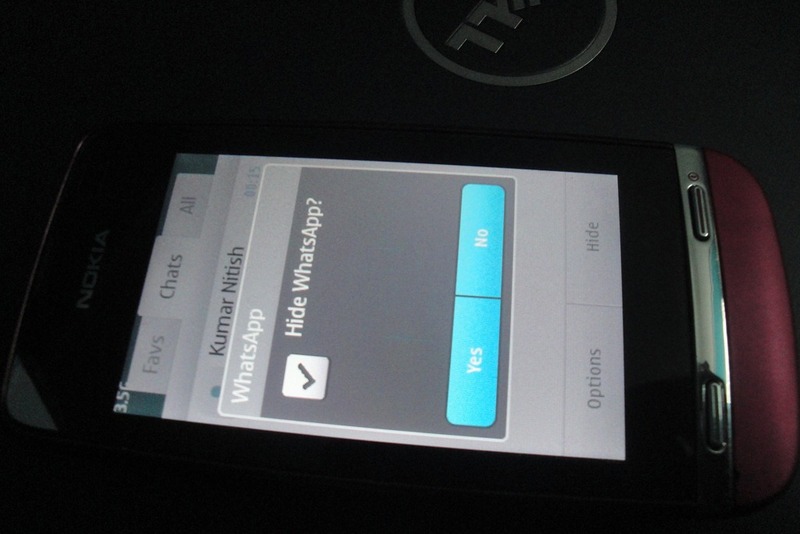 Whatsapp works: Yes! 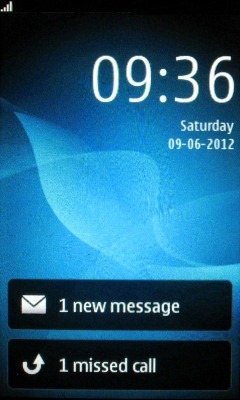 Whatsapp for S40 works as some of the friends on twitter asked me about. Only one need to care that they should not close it but hide it only. 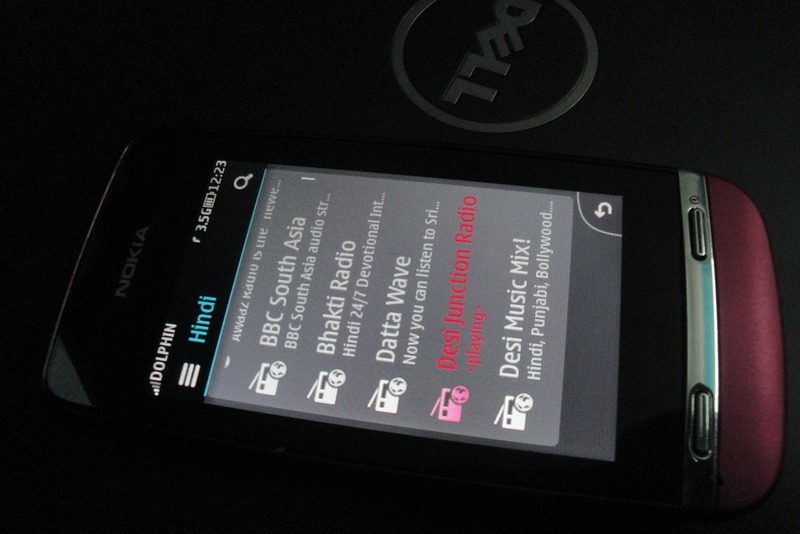 I don’t really know that how they manage to run it in background if S40 doesn’t support multi-tasking. 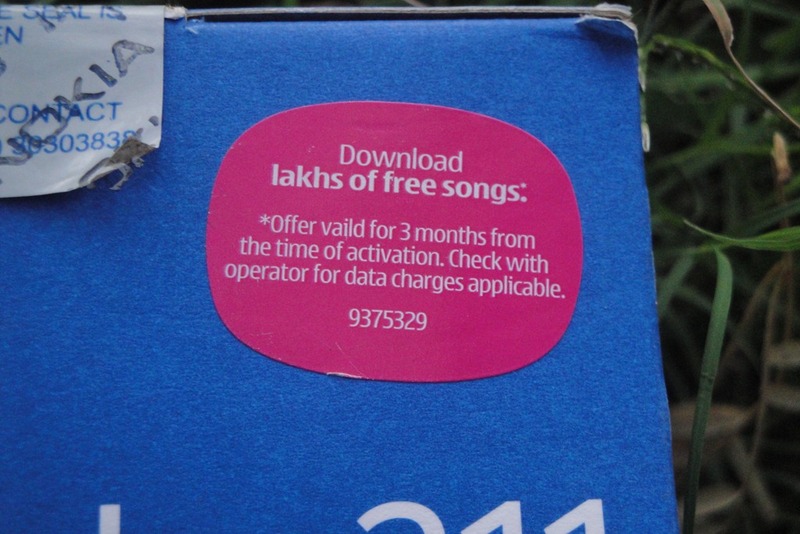 Nokia Internet Radio: I am not sure if people use such services that much in India and if this is more profitable than Nokia Music service that downloads the song to phone for permanent. 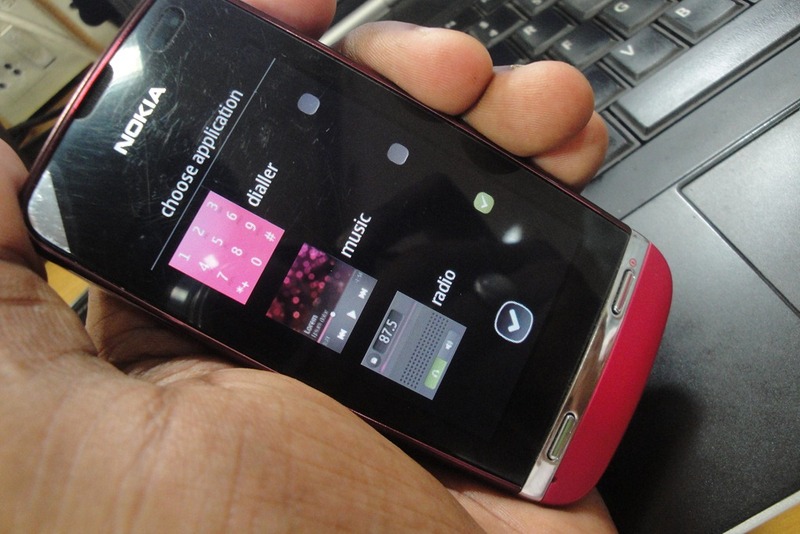 Nokia Music: I actually have started liking Nokia Music and want to see this service on each phone I own. Latest songs for free, to keep and to share legally. Timer App: Not a big one but was interesting to see the implementation of Timer app in this way. Innovative. 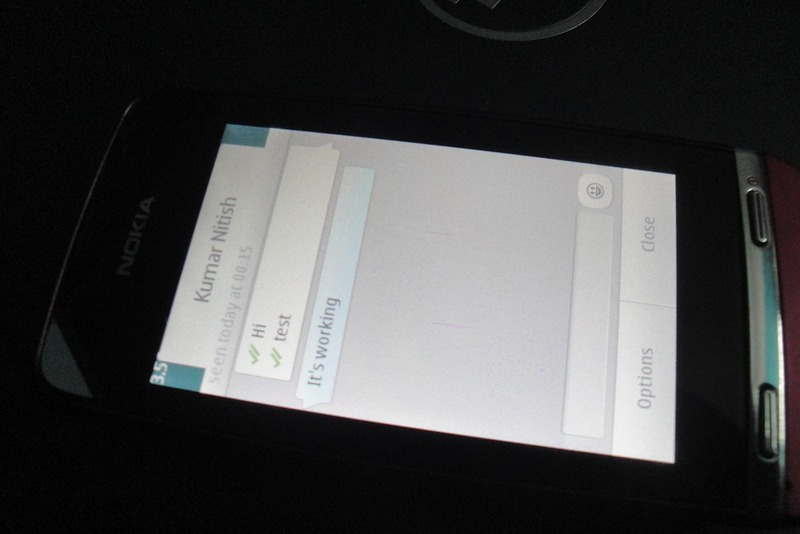 Nokia Chat App: The chat app supports Google Talk, Facebook Chat etc and runs in background while doing anything else (green icon on the top). 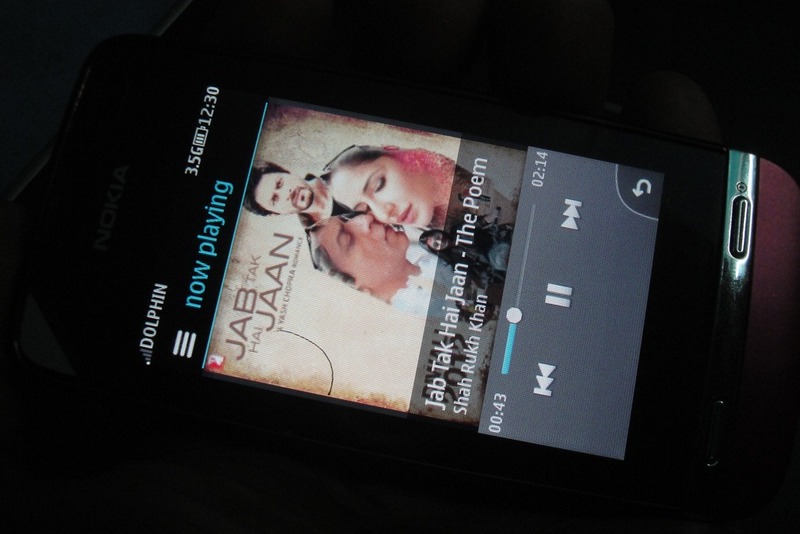 The UI is a little different than the one in Nokia Music and Music Player has the ability to play over Bluetooth. 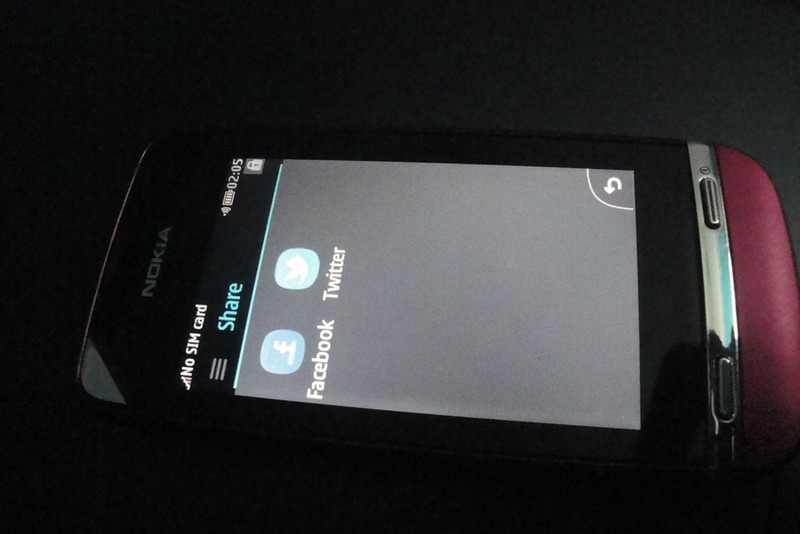 Games: Like I mentioned earlier, Nokia Asha 311 allows you to download 40 EA Games on it and they actually work very well. Let’s check out a video demo where I chosen the racing game as I found Angry Birds for S40 a little hit and miss on scale of perfect touch. So this was about Nokia Asha 311, which might be a cheap phone in price, but worth every penny spend. 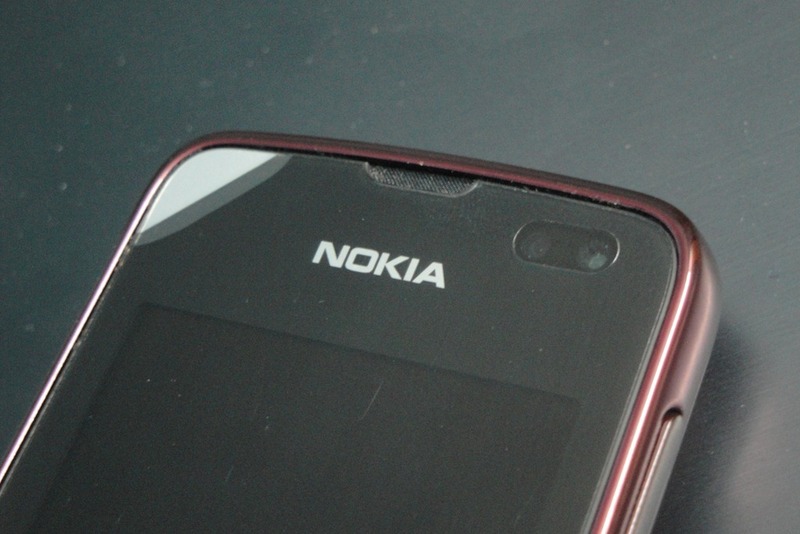 It would be long after Nokia C5, when I would actually recommend some low end phone. Do you agree with me that this thing actually something? Good review, though 311 is not smartphone in classical sense, I surprises with what it has to offer. 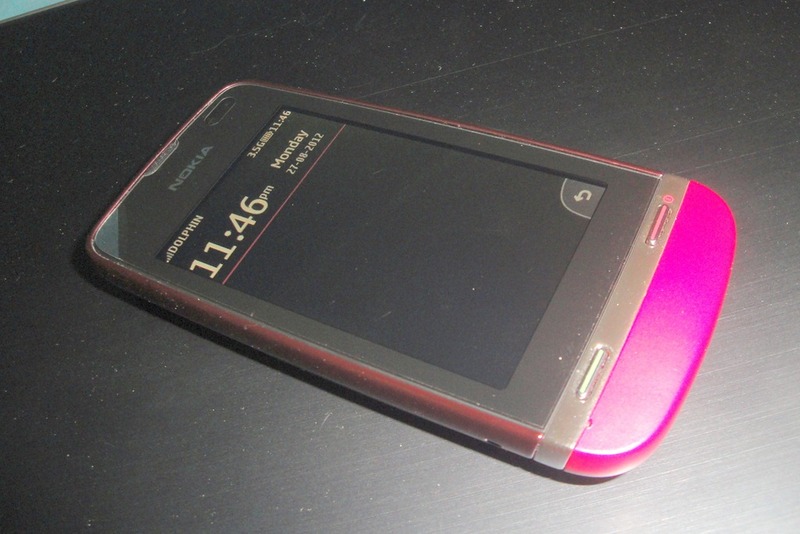 I will call it SmartLite phone. I am definitely recommending this since it was launched to people who don’t bother to check definitions of smartphones or as backup phone. S40 phones can do SyncML synchronization with servers. 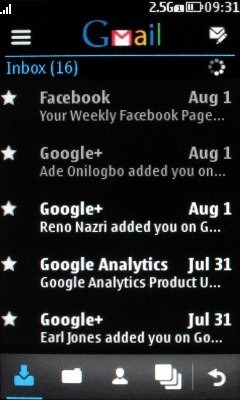 I do it with Google contacts and Ovi. You need to either manually create sync profile in configuration or send from service. (in case of ovi). It wasnt available in some S40 phones like my X2-02 initially but got it after fw update. Articles like this r why I consider ur blog a must read ! Well written , very insightful , and the different point of view from typical western reviewers r most refreshing ! 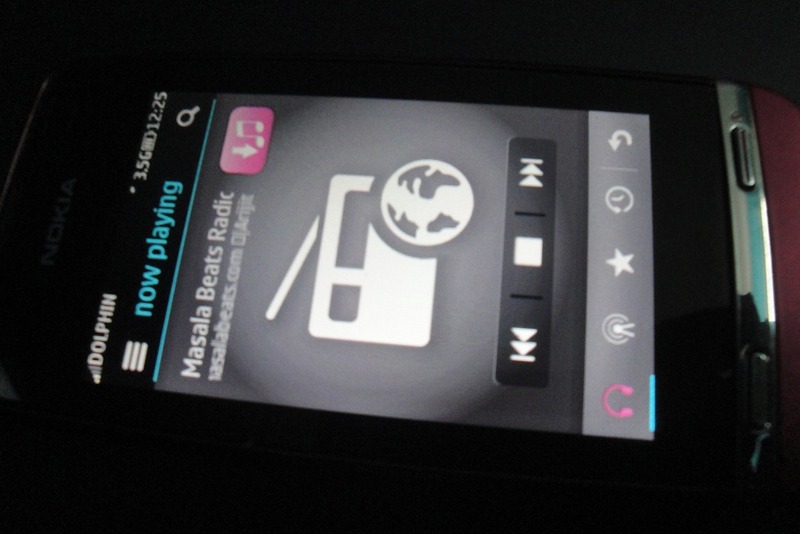 I`m from the USA but I`m seriously an ASha phone for backup handset . I love the 311 , but I want a QWERTY ( physical keyboard ) as well . 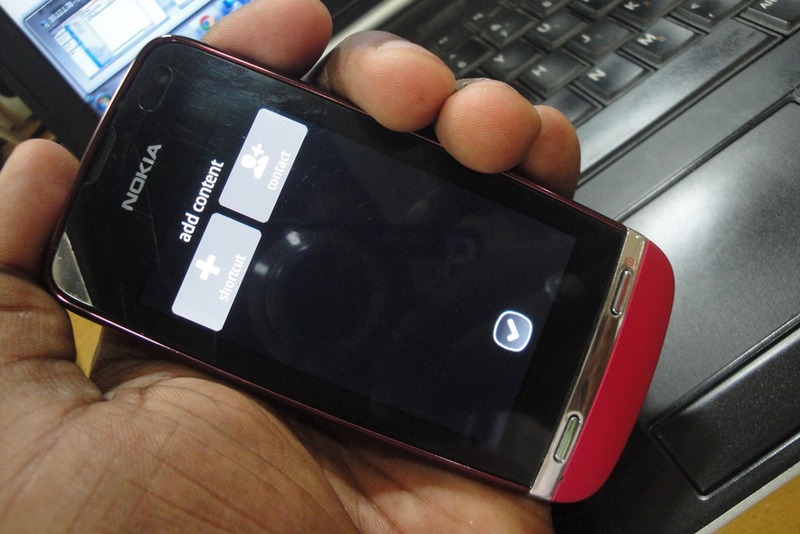 If only Nokia would make a QWERTY Asha Touch phone , sighhhh …. Anyways , my choice is between the 311 and the 303 . How would u choose ? Thanks in advance for ur opinion ! My choice would be 311 over 303. Yes , 303 looks ugly iMO. Also that QWERTY keypad on 303 is not that good to type on. It is cramped, 302 has better keypad but doesnt have touchscreen. 311 has a pathetic battery life. 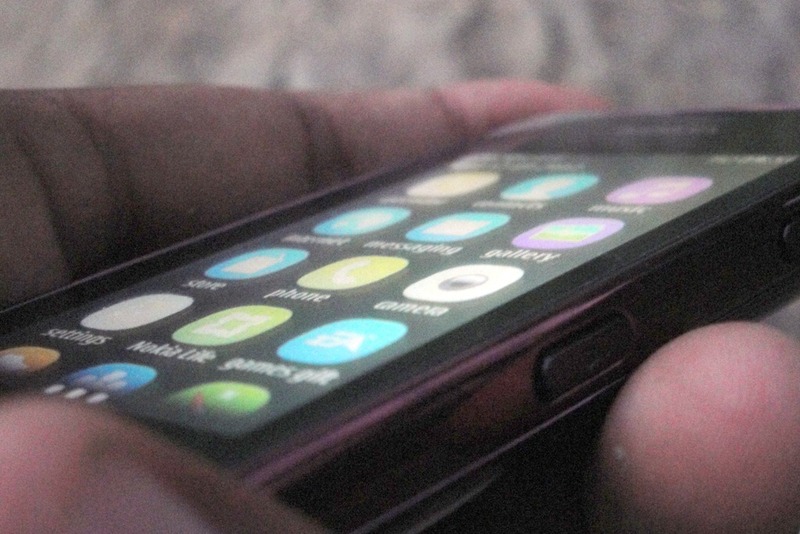 Pay attention to the battery life specifications before buying a phone! hi. can u tell me how to group the contacts for sms purpose? i can’t seem to find this option anywhere.. also can u tell me a software which supports ms office and pdf files for 311? 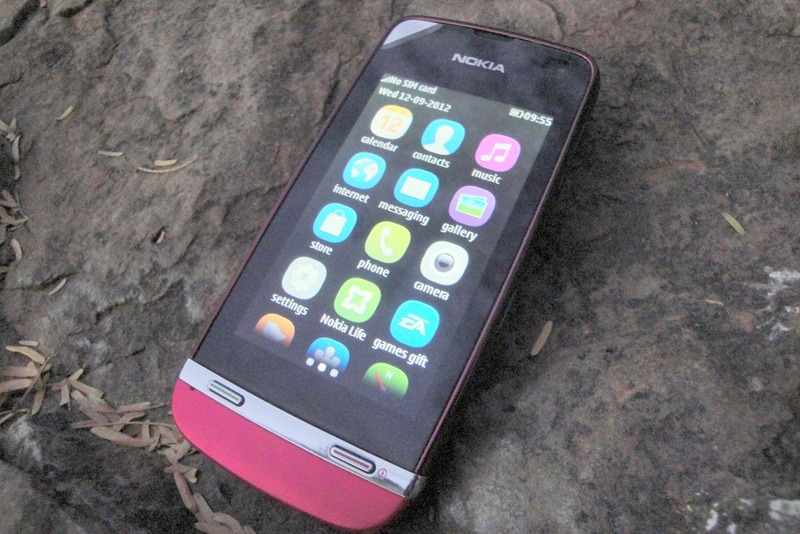 i love this phone… !! 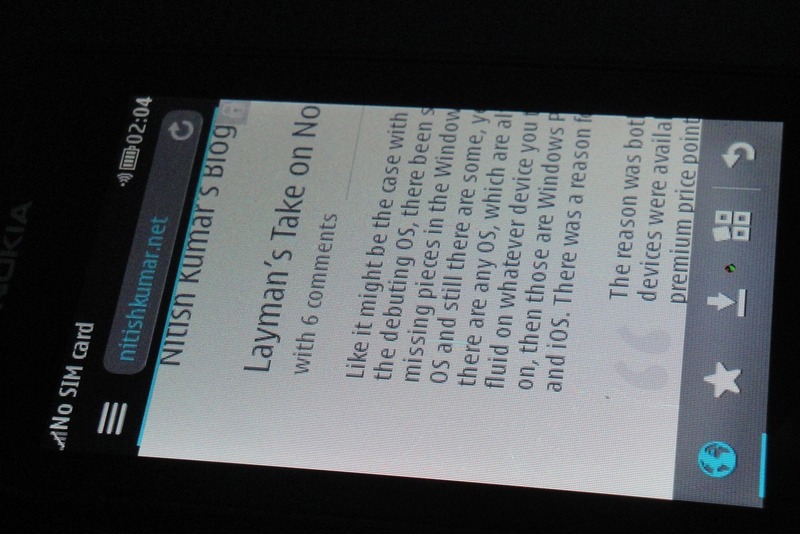 Next Next post: Layman’s Take on Nokia Lumia 900–Bigger sibling or a new character?